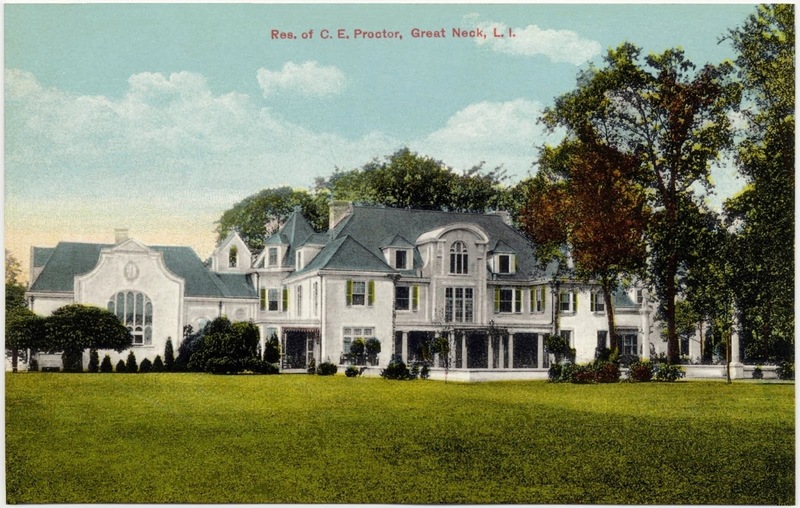 'Shadowlane', the Charles E. Proctor estate originally built c. 1900 in Kings Point and expanded by Little & Brown c. 1914. Click HERE to see the first 'Shadowlane' and HERE for more on the house after the alterations. 'Shadowlane' has since been demolished. This house encapsulate the design ethos that seems to inspire so many mansion builders today: a little of this, a little of that. Magnus, don't you mean 'a lot of this, and even more of that and while we're at it, a bunch of those too'? So, I'd like to know who might the person in the photo posed descending stairs to the pergola at the edge of a pool. The neighborhood there was choke-full-o trip-the-light-fantastic-toe, top-hat, cane and cape clinquant, tapping their way to fame and glory. That stairway would be irresistible. And then this may not likely be related to today's post, but is from that same photo collection, a Farmyard Meets Kennel kind of a thing which maybe cool, not really sure, but chapeaux off to you all nonetheless. I hate to think myself one of those gaudy McMansion types, but I love the eclectic style of this estate. I also think I may be the only one who visits this site, that loves the original "steamboat" interior of Martin Hall. Anon 9:01 you are not the only one, ha ha, I enjoy the enthusiastic potpourri of architectural Xanadus featured here far more than some staid, prim and proper Federal mansion which I daresay gets the most favorable opinions here. Much prefer to enjoy long islands fantasy gems in silence than be drowned out by a chorus of naysayers. In total agreement though, Martin Hall's original interior sure beats the boring and expected anyday.